This is a follow-up to my Néojaponisme post (and related No-sword post) about the introduction of the Western calendar to Japan. The question: What about days of the week? The answer: Obtained from Meiji kaireki: "Toki" no bunmei kaika 明治改暦 「時」の文明開化 ("The Meiji calendar modernization: The bunmei kaika-tion of 'time'"), a book published in 1994 by Okada Yoshirō 岡田芳朗. The weekly-rest system [i.e. the system where rest days were determined by day of the week rather than "days with a date ending in 1 or 6," as was typical up until this point] began in government, schools, the army, and other public institutions, then spread to metropolitan areas, particularly in large corporations and companies involved in foreign trade. However, it was not until after World War II that it finally began to spread to small and medium-sized companies and especially rural areas. The economic miracle of the late 1950s and early 1960s was when the system finally became standard nationwide. [...] The adoption of the weekly-rest system had a strong economic effect with respect to labor and paid holidays, and required a change in the overall structure of society. It seems that the first people in Japan to adopt "the week" (as something other than a divinatory tool) did so because they had no choice: they were dealing with European or American traders in Yokohama, or they were working alongside "hired foreigners" in government, education, or the military. It made no sense for them to turn up to work when your trading partners or co-workers were taking the day off, or vice versa. Okada doesn't mention why the Meiji government didn't just write "must work on Sundays" into their contracts for hired help, but the religious component was probably a factor. Back then more Christians took the Sabbath seriously. In any case, if all of your external consultants say "a seven-day week with 1.5 days off is the only way to run a government/army/school," eventually you're going to start to believe it. Anyway, this led to a situation where "the government and the people have different days off" (官民其休日を同じふせず), which in turn caused mutual indolence when they saw each other slacking off on work days (相見て互いに惰心を生ず). The above quotations, by the way, are from the Tokyo Nichinichi Shinbun in the tenth month of Meiji 5, before the calendar had even gone solar. So the week-system issue was to a great extent independent of the solar-calendar issue. Anyway, in Meiji 7 the government declared Saturday afternoon and Sunday the official holidays in all schools and, a few months later, public offices. (Kanagawa prefecture had already done this locally — they had that port full of foreigners to deal with, after all.) After that, it began to percolate down through the rest of society, finally saturating Japan after WWII as noted above. The end. Here's a poem by Ikkyū that I probably don't understand. Its title is 自然外道, i.e. "The Naturalist [or Senika] Heresy." This is the belief that there is no such thing as causality so you should just do whatever, man, because everything will spontaneously happen as it should, and you're, like, already Buddha. Dōgen in particular got very worked up about the naturalist heresy. He believed in discipline. When the Great Way is abandoned, the Way of Man arises. Who breaks from wisdom sinks deep into ideas. Pipes and strings, singing and playing: these are within humanity's power. The wind and rain is the music of the world. The first two lines are a reference to chapter 18 of the Tao Te Ching : "When the Great Way was abandoned, ethics appeared. When wisdom emerged, deceit appeared." (大道廢，有仁義；智慧出，有大偽.) Of course, Ikkyū is no doubt talking about the way outlined by Buddha rather than what Laozi had in mind, which might be why he changes the second line: 智慧 (here translated "wisdom") is a term of art in Buddhism, and a desirable thing. "Ideas" (義), which could also have been translated "reasoning," "logic," "words," etc., are no substitute for 智慧. Ishii "de Sade Trial" Kyoji 石井恭二, the editor of the Ikkyu edition I have, claims that the first line is subtly altered too: "人道" means not just ethics, morality, the right thing to do, but also the "human" level of the six realms: we are down here because we have quite literally lost our Way. The second half is the interesting bit. My interpretation would be something like this: "Yeah, the wind and rain happen spontaneously as they are supposed to, and that's the music of the universe — but humans make their own music, and that's the flaw in the Naturalist Heresy." But I wouldn't bet very much money on it. Anyone got a better interpretation? Today I am going to look at the haiku written by Bobby Shaftoe in Neal Stephenson's Cryptonomicon , in the original English and in the Japanese translation by Nakahara Naoya 中原尚哉, volume one of which I happened to get hold of the other day. First, the good. Everything in this haiku is happening right before the author at the time of composition. Strict reliance on immediate perception is often cited as a key rule for haiku, although of course it's not hard to find examples of its having been profitably broken. The "bamboo grove" might be too metaphor-y for some, in this context; me, I'm okay with it. Next, the bad. This haiku exemplifies the Two Great Evils of English haiku: strict adherence to 5/7/5 syllable structure, and too much information. The two are related: because there is more information, on average, in an English syllable than a Japanese mora, if you insist on 5/7/5 syllables, you end up with more information than can fit in 5/7/5 morae. The result here is that Shaftoe's haiku overflows with imagery. It is a riotous collage rather than a careful juxtaposition. The lingering impression it leaves is not "Ah! How poignant!" but rather "What the hell just happened?" In Shaftoe's defense, he wrote this haiku "standing on the running board [of a truck teetering on two wheels], gripping his Springfield with one hand and the rearview mirror with the other," but since his main aesthetic concern is syllable-counting ("Is 'tires' one syllable or two? How about 'wail?'") it seems fair to assume that this haiku's flaws derive from Shaftoe's 11-month-old understanding of the art rather than his circumstances, however extenuating the latter. And, indeed, in chapter 3 we learn that although Shaftoe learned about haiku from a real-live Japanese person, Goto Dengo, "as far as he could tell" it was about counting syllables and nothing else. Anyway. How does Nakahara translate Shaftoe's book-opening haiku? Notice how much has been shaved off getting it into 17 morae — and it's still too busy. Those three images should be whittled back to two. I would remove the katawa naku bit, since it superimposes the author too vividly into the scene. The jostling forest of bamboo sticks and singing money-porters is more than enough. "Wind," "ether," and "searches" all had to go, but the core image is retained. Note that Nakahara indulges in ya, a traditional "cutting word" used to delineate intra-haiku structure. One more, this from much later in Shaftoe's career. (Glory is Shaftoe's lover.) Obviously traditional haiku criticism would have very harsh things to say about the sudden dip into vulgarity at the end. Even for a senryū this would be pretty edgy. Glory's thighs are also problematic because they represent an intrusion from Shaftoe's imagination on what is actually there. I do like the interlocking processions of ideas, although the coconuts-and-perfume imagery for Manila is cliched. Shaftoe's thighs of Glory have become much more generic though no less crude. This is a net loss, although probably unavoidable. tl;dr: Shaftoe's haiku are carefully crafted to stuff in maximum information. This increases their vividness and therefore their utility as storytelling tools, but affects their quality qua classical, Japanese-style haiku. It also presents intriguing and difficult challenges to the translator, which depending on your point of view might actually be a benefit. The nue is one of the more bizarre Japanese mythological creatures. It is a chimera that makes no sense at all: monkey's head, tanuki's body, tiger's legs, snake for a tail. Oh, and the voice of a nue. Before you say "Well, duh," though, let me point out that what was meant by this was "voice of the bird known as nue since ancient times in Japan, probably White's thrush." Here, the nue (nuye being the old form) is just a regular bird like any other, representing for the mountains. But when we encounter the same bird in the Man'yōshū (example), it's associated with melancholy and grief. Nuedori, literally "nue bird," is actually a pillow word for cheerful concepts such as unrequited love and weeping in one's soul (uranakeru). By the Heian period, the voice of the nue had become an omen of ill import, the sort of thing you needed to hire a consultant to deal with. ("Which is the most auspicious direction in which my retinue and I can flee?") Things got even worse for the poor nue when someone noticed that it was described in Chinese texts as a 怪鳥, literally "monstrous/uncanny/eerie bird," although this really just meant "nocturnal bird" in Chinese. So, by the Kamakura period when the monster-nue made its first appearance in the Heike monogatari , it totally makes sense for it to have the voice of a bird which is by now associated with supernatural doom and woe. The remaining mystery is how that monster came to be called a nue too. It is not actually given this name in the Heike monogatari . It isn't given a name at all. A. L. Sadler's 1928 English translation, the one now available from Tuttle, includes the sentence "The Nue they put into a boat and set it adrift," but the original for this is "Sate kono henge no mono o ba, utsuhobune ni irete nagasarekeru to zo kikoeshi", i.e., "They put the monster into a boat [made of a hollowed-out log] and set it adrift" + "lo have I heard" storytelling cruft. Helen Craig McCullough's 1988 translation for Stanford, incidentally, renders the same sentence as "The monster was put in a dugout and shipped downstream." Now, the text does follow the monster story up with another nue-killing anecdote, and in this second story the word nue is used to describe the victim — but this nue is specifically described as a 怪鳥, a bird-monster, and not the weird chimera of the first story which has become the standard nue-monster of today. In China, Yang Youji shot a goose down from above the clouds; in our land, Minamoto no Yorimasa shoots a nue in the middle of the night. And why did this happen? Looks like the author merged the chimera-nue and the monster-bird-nue anecdote mentioned above, creating a super-story featuring a super-chimera with the body of a chimera and the name of a nue. Yamaguchi also suggests that the monster was dubbed "nue" because, well, what else are you going to call it? Everyone knows what a monkey or a tiger is. Not everybody knows what a nue is, except that it's scary and flies. Anyway, the result is that today, a nue is a monster, with the bird a distant, oft-forgotten secondary meaning. There's even a derivative word, nueteki ("nueic"), used to describe things that are mysterious or unknowable. I (finally) wrote a new article at Néojaponisme: The solar calendar, the two Ms, and Fukuzawa Yukichi. It is about the remarkably sudden adoption of the solar calendar over the Meiji 5−6 new year, and about Fukuzawa Yukichi being kind of a jerk about it. As usual. I spent most of last week's train rides reading Kōki, Banpaku, Orinpikku: Kōshitsu brando to keizai hatten ("The Imperial era, expositions, and Olympics: the Imperial Household brand and economic development", 皇紀・万博・オリンピック　皇室ブランドと経済発展), by Furukawa Takahisa 古川隆久. The book consists in large part of close examination of proposals and memos sent back and forth between minor Meiji bureaucrats, meaning that at times it is almost too information-rich: it's not easy to maintain a grip on the big picture when you are simultaneously being peppered with mini-resumes of every functionary involved in its creation. But this same information-richness can also be a source of great entertainment. So, how did the common people greet the new year? Let us begin by examining newspapers and general-interest magazines. In the newspaper world, we do find at the end of 1939 articles like "Astonishing! Conductor bald-off: a gift for the shining year 2600," a facetious proposal for a contest in which Yamada Kósçak and three other bald stars of the music world (composer Komatsu Kōsuke, navy band bandleader Naitō Seigo, and New Symphony Orchestra member Komori Sōtarō) would compete on the basis of shininess of head ( Kokumin Shinbun , December 5 morning edition; there is, incidentally, no evidence of the contest having actually been held), but articles and editorials in the first three days of the new year tend to treat the topic of the 2600th anniversary seriously, taking their lead largely from the government's own announcements. Many of the advertisements also have Year 2600-themed designs, including advertisements for red light districts. Even the light-reading sections had topical jokes, if rather desperate ones. For example, Enomoto "Enoken" Ken'ichi and Furukawa Roppa's "Dragon year manzai," which appeared in the Kokumin Shinbun 's New Year's Day edition: Roppa: "Spring has arrived in the fourth year of our holy war"; Enoken: "How time flies"; Roppa: "And it's also the 2600th anniversary of Japan's founding"; Enoken: "2600 years"; Roppa: "In Western terms, the year 1940"; Enoken: "And I'm Ebara-5373"; Roppa: "That's your phone number, dummy"; Enoken: "Heh heh heh"
I tried to find some pictures of Year 2600 advertisements online, but failed. Here's an essay I wish I'd read earlier: "The myth of zen in the art of archery" [PDF], by Yamada Shouji 山田奨治. The central thesis: Eugen Herrigal's famous Zen in the Art of Archery depicts not a relationship with a wise and inscrutable zen master, but rather a relationship with a deeply idiosyncratic archer-mystic who may have dabbled in zen a little, rendered inscrutable by an imperfect interpreter. That is to say, whatever subjective meaning Herrigel and his modern fans may have found in his experiences and book, objectively speaking the work has very little to do with zen or non-fringe Japanese culture. Herrigel became Awa’s student [...] one year before Awa began to talk about founding Daishadōkyō 大射道教 (Great Doctrine of the Way of Shooting)—a proposal that provoked fierce opposition among Awais students at the Number Two College and at Tōhoku Imperial University 東北帝国大学. In 1927, in his forty-eighth year, Awa overruled the bitter objections of his students and formally established a new organization named Daishadōkyō. Awa's students at the Number Two College later testified that Daishadōkyō consisted of "archery as a religion," that "the founder [of this religion] is Master Awa Kenzõ," and that "the master described his rounds of travel to provide guidance (shidō suru 指導する) in various regions not as [archery] lessons (keiko 稽古) or as instruction (kyōju 教授); he said that he was doing 'missionary work' (fukyō 布教)" (SAKURAI 1981, pp. 210–11). Extra scuttlebutt: a scathing review of Zen and the art of archery by Earl Hartman, translator of Yamada's article (with comments!). And here's Hartman again, flaming zensters on a martial arts bulletin board. And here are some miscellaneous zen-critical essays. Yamada also wrote a follow-up about Herrigel's Nazism, but it's in Japanese only and apparently not easily available online to us plebs. I mean, we plebs. Shinzei kogaku zu ["Shinzei's illustrated guide to venerable entertainments"] is said to date to the late Heian period, and although there is some room for doubt over whether the pictures came directly from China or whether they represent dances and entertainments transmitted to Japan, there are a number that appear to be shuju dances. 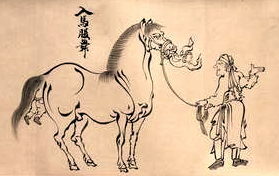 For example, the "Enter-a-horse's-belly dance" and the "Enter-a-pot dance" involve entering a horse from its behind and coming out of its mouth, or popping in and out of a pot while waving long sleeves; these are clearly shuju dances. Whatever the literary equivalent of the movie-trailer record-scratch sound is, I heard it in my head about halfway through this paragraph. Excuse me? The "Enter-a-horse's-belly dance"? This looks like a job for research on the internet. Now, obviously this did not really happen. The Heian period was not a Police Academy movie. The Tang dynasty was not a cartoon from Oz magazine. Nevertheless, here we have this picture. What are we to make of it? Fortunately, Kawai Masaru 河合勝 and Saitō Nobuhiro 斎藤修啓 have already done the heavy lifting for us here, with a poker-faced monograph entitled A Study of Horse-Swallowing Illusion ("Donbajutsu") of Japanese Classic Magic (日本古典奇術「呑馬術」について). The trick, they say, was simply to hang a black curtain behind the horse, and allow the performer to disappear behind it and reappear at the other side. This, they note, is known as "the black art" in modern magic, and they hypothesize that horse-swallowing was effected the same way. Thus, they argue, the pictures of people swallowing horses in brightly-lit rooms, before audiences spread too widely to the side, do not reflect actual performance conditions. I sort of prefer to believe that horse-swallowing is possible. But I do not feel the same way about the enter-a-horse's-belly dance. So hot! But I learned a new Japanese proverb: Natsu no mushi, kōri o warau, "Summer bugs laugh at [the idea of] ice." Use it to describe someone who knows less about the world than they think. Ruo, (the Spirit-lord) of the Northern Sea, said, "A frog in a well cannot be talked with about the sea - he is confined to the limits of his hole. An insect of the summer cannot be talked with about ice - it knows nothing beyond its own season. A scholar of limited views cannot be talked with about the Dao - he is bound by the teaching (which he has received)." Yes! Zhuangzi is also the source for the famous "frog in a well" analogy (meaning basically the same thing). Although he used that one more than once.